Shipping to Europe? Use 1200x800 pallet collars! Full packs neatly stacked for storage. Each contains 105 pallet collars. These pallet collars are designed to fit over the European standard size 1200x800 mm shipping pallets, also known as the Euro (or EUR) pallets. The specially designed hinges ensure the collars stack up and do not slide sideways off the pallet. Simply stack as many pallet collars on a pallet as needed - you'll build a pallet box of the required height in seconds without any tools! Each pallet collar is 195-200 mm high and weighs just ~8 kg. When flat folded for backloading or storage, the collars are ~1900 mm long. 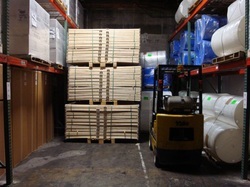 They come in standard packs of 100-105 pallet collars per pack for bulk orders. All orders, small or big, are welcome! Any questions or need a quote? or call 0403 693 621 for details.